SAME DAY INSPECTION REPORT. 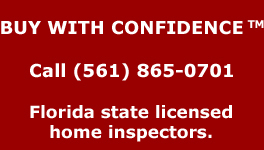 Receive your Inspection Report after the Inspection on the same day. FREE TELEPHONE CONSULTATION. Included in the Inspection a telephone consultation, if requested, to clarify any items for you after you've had some time to read through your Inspection Report. Home Inspection. I recommend him highly." 3 bedroom / 2 bathroom - 2000 sq. ft.
2 bedroom / 2 bathroom - 1200 sq. ft.
2 bedroom / 2 bathroom - 1000 sq. ft. Mold Inspection, Mold Tests, Wind Mitigation, and Other Services Available. *Prices subject to change. Customized quote can be provided. © Feldman Building Inspections, Inc.